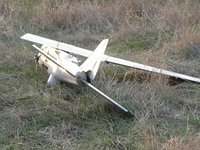 On January 23, Ukraine's Joint Forces Operation (JFO) servicemen spotted an unmanned aerial vehicle (UAV) in the sky over the Azov Sea, the press centre of the Joint Forces Operation (JFO) has reported. "After it was inspected by military engineers, the device was handed over to specialists for identification and further study. It was established that a Granat-2 unmanned aerial vehicle is produced by enterprises of the military-industrial complex of the Russian Federation," it reads. It is noted that Russia has been supplying this type of drones to the illegal armed formations of the so-called "Luhansk and Donetsk People's Republics" for aerial reconnaissance and artillery spotting. "It is this UAV that will no longer work in the interests of the aggressor. All information from digital carriers will be carefully studied and analyzed," the headquarters said.